Dr. Khosla is board certified in general pediatrics and is a Fellow of the American Academy of Pediatrics. She earned her medical degree from the University of Connecticut School of Medicine and completed her pediatric residency at the Morgan Stanley Children’s Hospital of New York at Columbia University. 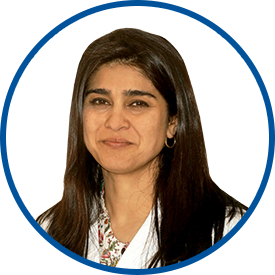 After completing her residency, Dr. Khosla was an instructor in clinical pediatrics in the Department of Emergency Medicine and Neonatology at the Morgan Stanley Children’s Hospital of New York. Before joining Westmed, she practiced pediatrics in Greenwich, CT for 11 years, managing and directing all facets of pediatric care, ranging from neonatal to adolescent care. She is an attending pediatrician at Greenwich Hospital and Stamford Hospital. Dr. Khosla lives in Scarsdale with her husband and three sons. She is deeply involved in the local school and enjoys volunteering. I have recommended *Dr. Khosla to various friends. excellent dr. and bedside manner. going to also bring our son from now on. Dr Khosla is very easy to talk to. there's no such thing as stupid question. she'd answer every question in an easy to understand way.She has a rare combination of intelligence, professionalism, and sincerity. I'm very happy with Dr. Khosla and her management of my son's medical care. I feel she went above what I have experienced with pediatricians in the past. The overall visit was very detailed and informative.